Here's an interesting recipe to try this summer! Pour the water in a clear glass jug. Place the tea bags in the water. Leave the jug in the sun (sky should be clear) for 2 hours. Best to do it after 10 am when the sun is bright. After 2 hours, remove the teabags, gently squeeze out the water from them and discard them. Place the tea in the refrigerator for a few hours. Pour over ice and serve. Alternatively, you can squeeze 1/2 lime or orange into the chilled tea. Other flavor options are ginger or lemon grass or mint. If you need sweetness, add a teaspoon of honey to it. This beverage will remain in the refrigerator for a few days. Discard it if it turns cloudy. 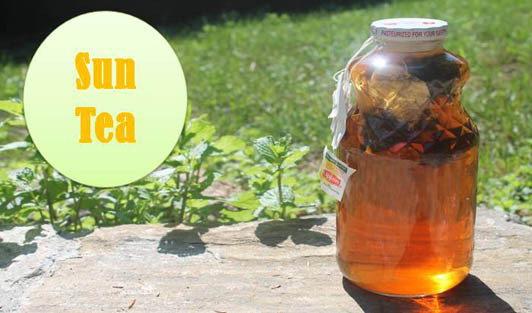 Best aspect of sun tea is, it saves energy!